Yoga is being practiced from 100s of years in India, but it now has a global presence because of the efforts of some Indian saints. Many people have stopped visiting gyms, dance classes because they have started practicing Yoga. Believe it or not, these people have benefited from this move. Yoga is an Indian invention and over 20 million across the world practice it every day. Various renowned Yoga Gurus claim that exercising yoga poses every day for 10 to 20 minutes is enough to keep the body in good shape. Practicing Yoga is one of the best and cheapest ways to keep oneself fit. It helps in keeping the blood pressure and sugar at a normal level. People who perform Yoga exercises regularly are less prone to life-threatening diseases and common viral infections. According to studies, Yoga is a perfect natural solution for many health disorders. Because of the latest technologies, it is possible to practice yoga without spending a dime or hiring a Yoga coach. Simply open YouTube.com on the PC and search for Yoga videos from Baba Ramdev or download the below best yoga apps on your cell phone and use them daily. With a huge user base of 1+ million and a superb rating of 4.2, DY is the best Yoga app for Android. 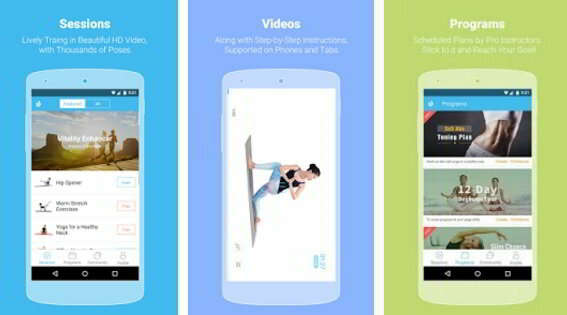 DY allows you to watch high-quality HD videos of a person demonstrating various yoga asanas. The yoga coach explains the steps as if he were in front of you. As the app provides a good explanation of the exercises, beginners can learn new postures quickly. 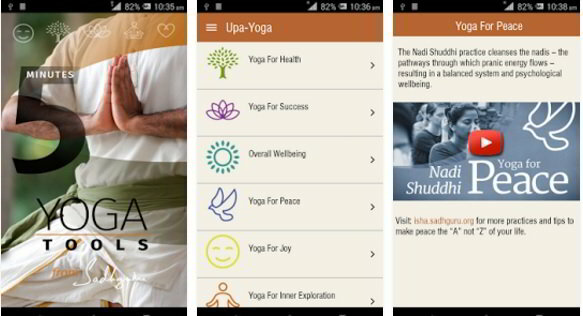 This free Android app covers 450+ asanas. It provides access to over 50 powerful exercises which helps in improving fitness, balance, health and reducing weight. 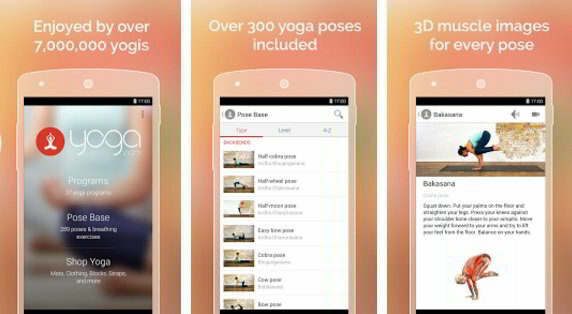 The Daily Yoga Android app has a search videos option. It categorizes videos in three categories i.e. intense, casual and moderate. The length of videos ranges from 5 minutes to 45 minutes. The Android daily yoga app has special background music to keep a person calm and composed during a Yoga session. It comes with a health rating system. When you have completed an exercise, your health score will increase. You can share the score with other users. The DY app supports social networking. You can follow or unfollow other users of this app. You can also chat with them. This is a useful feature. If you find an experienced yogi, you can get tips from him/her via messages. This app supports data syncing with Google fit service. It packs a live voice guide module. Its APK size on the Google Play Store is 14 megabytes. Daily Yoga runs on devices powered by Android 3.0 to Android 6.1 operating systems. According to its Google Play Store page, this application from Yoga.com has the same number of users as the above app. For some reasons, it is not as popular as DY. Yoga.com allows you to watch 37 high-definition videos of a yogi explaining 289 different poses. This app is suitable for newbies that have started practicing yoga recently. It is also useful for the users that are aware of common Yoga asanas and are willing to learn some new exercises. Yoga.com features 4 breathing exercise videos. When the app plays a video, an image describing what muscles will benefit from the exercise and instruction on how to execute the step will be displayed. As YDC is a widely used application, it is one of the best yoga apps for phones. In this app, you’ll find small but useful exercises of 5 minutes explained by none other than popular Indian yogi and saint Jaggi Vasudev. Before you begin watching the exercise video, the app will make you aware of the benefits of the exercise. According to the Isha Foundation, the publisher of this Android app, the exercises are short, but they’ll have a positive impact on your life. You’ll become more focused, less emotional and your confidence level will increase if you practice Yoga regularly. According to the developers of this app, if you practice the 10 exercises displayed in 10DYP daily, you’ll be relieved from stress and your mind will be calm. The application maintains a workout file. It calculates your fitness level and has a reminder feature. The app has a simple user interface. It is RAM/CPU friendly as well. Conclusion: Millions of people practice yoga every day. If you’re planning to get started with Yoga, download one of the above apps and follow the instructions.